In early February, Julie Verhoeven opened her new shop GIBO in Conduit Street, off Regent Street. She is already known as an illustrator of decadent female figures with huge eyes, and has now incorporated her art into her Spring/Summer 2003 collection. 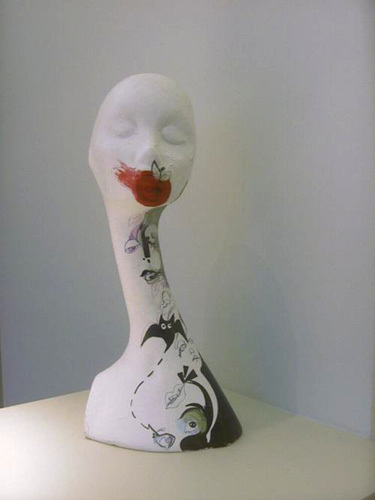 Verhoeven studied fashion at Medway College and got her first job as an illustrator for John Galliano. After four years gaining invaluable experience of the fashion industry, she decided to pursue a freelance career. She worked steadily over the next few years until in 2001 her big break came when Marc Jacobs commissioned her to design a collection of handbags for Louis Vuitton. The limited version handbags (4 types and 100 editions each) became so popular that the international waiting list filled up immediately. It was this success that led her to meet Franco Pene, chairman of Italian manufacturing company and new label, GIBO, which was looking for a new designer to launch its first eponymous collection. The shop window resembles a land from Gulliver’s Travels: a huge cassette tape and an equally oversized paint tube welcome you. 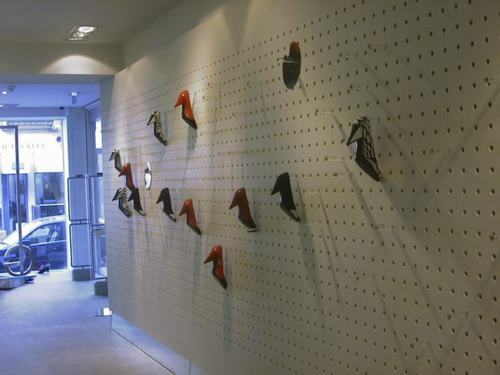 Inside you are immediately struck by the ‘shoe wall’, a 6.5m long textured concrete surface with coloured pegs jutting out of it where Verhoeven’s creations – pointy high-heeled shoes in red leather and others with black and white geometrical designs – are displayed. Further inside the shop is an area where natural sunlight floods in from the windows above, and where her collection, featuring vibrant, bold colours, is displayed. The characteristics of her illustrations can be seen here, very effectively printed onto her shirts. The whole collection is hung on metal frames, which can be re-configured and folded down into the grooves in the wall to suit any occasion. 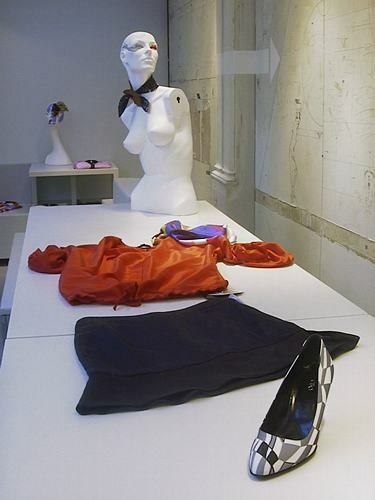 Another feature of the shop are the many mannequins placed around the display area. They have no arms or legs and are not there to display Verhoeven’s designs (except for the fabric chokers some of them wear), but to present themselves as three-dimensional versions of figures in her illustrations. Has Verhoeven put her illustrator’s brush down and turned to full-time fashion design? It seems unlikely, by the look of the wall running along one side of the display area, which serves as an art space. Here, Verhoeven’s original drawings are accompanied by geometrical designs provided by her husband, Fabio Almeida (who is also an artist and a DJ). GIBO was welcomed enthusiastically at the London Fashion Week last September, and we expect to see more of Verhoeven’s artistic, energetic designs in the future.